^ Keep, John L. H. (2005). "10: Captive minds: faith, science, history". In Litvin, Alter L; Keep, John L. H. Stalinism: Russian and Western Views at the Turn of the Millennium. Totalitarian movements and political religions. Psychology Press. p. 153. ISBN 9780415351096. Retrieved 2017-02-01. 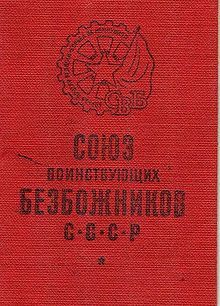 The principal vehicle for atheist propaganda was the League of (Militant) Godless, or LMG, headed by E.M. Yaroslavsky, which operated under close Party supervision and often in conjunction with its youth organization, the Komsomol. This page was last edited on 10 December 2018, at 03:06 (UTC).